Do you wanna to go to the south too? 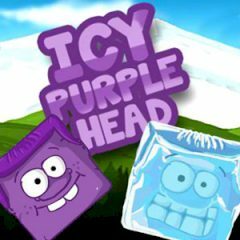 Then choose this game and help this purple creature go there. When you hold the mouse, he will become icy and slide over any obstacle. Use different objects and set the best record of the game. Enjoy it. This cute little creature wants to go to the south! This is his dream and you are the only one, who can cope with it. Purple, yes. And icy on demand! It is very important, cause when you get icy, you get slidey. And sliding is how you get to your goal that delightfully charming cardboard box. This is the best time your icy condition to make the most of a cold situation. Just use different objects and be sure that this game will bring you a lot of pleasure and satisfaction. The main thing is to solve each puzzle easily.